The past three days have been wonderful, as we toured Sydney about as hard as any travel photojournalist could. My tendency is to try out-of-the-way venues to add value to my readers’ experience, and this visit was no exception. First, some impressions. Sydney is as high energy as Manhattan, and I don’t say that idly, since I am a native New Yawkah. 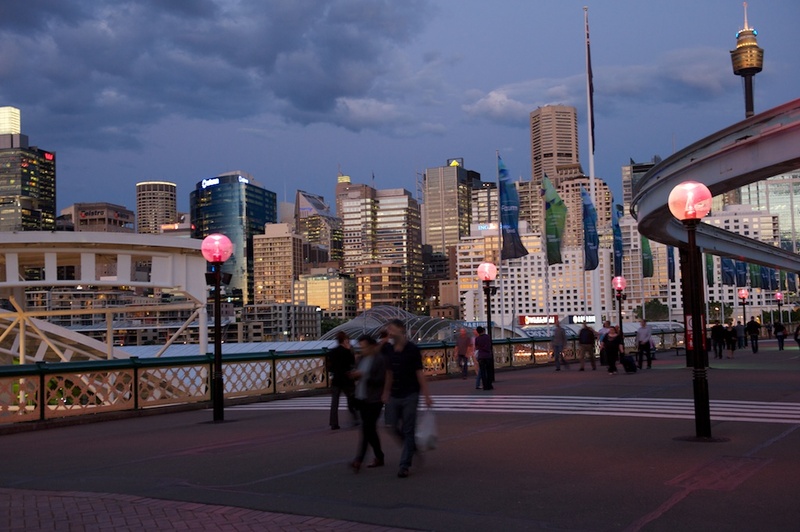 Sydney is every bit as frenetic and cosmopolitan, but in a wholly different way. We’re here in late October (spring) and it is sunny and bright, with the expected periodic rain showers. The city revolves around the water. Sydney is blessed with numerous harbors and the Aussies have developed them to a fine art. Take Baltimore’s Inner Harbor, New York’s South Street Seaport, San Francisco’s Fisherman’s Wharf and crank them up a notch or two and you have an idea of what a happening place an attraction like Darling Harbour, for example, is. People are busily shopping, leisurely strolling, savoring the diverse eateries, or else kayaking and biking along this massive urban playground. Oh, did I mention biking? Sydney is a biker’s dream. Bicyclists are everywhere, probably due, at least in part, to the ridiculously high parking fees in the city. We parked overnight, from 10:00 PM to 10:00 AM and it cost $72.00. While we walked around town, construction was going on in several places to increase the number of bike paths and also make the city more walker friendly, something that 97% of Sydneyites requested in a recent survey. And that is needed, because right now the city suffers from too many cars and excessive car noise. At some point every day my eyes burned from the car exhaust. But Sydneyites have learned to coexist with cars. They are an extraordinarily patient lot, as they wait for the walk signals to turn green, sometimes a very long wait due to the heavy traffic. The one time I impatiently crossed before the green pedestrian go-ahead light, I was pegged as a foreigner and stared down by a crowd of residents. One thing you will find out as soon as you have your first meal in Sydney is that it is one expensive city. A small bottled water is $3.00, a cup of hot tea is $3.50, and meals… forget trying to get a decent meal for less than $30, not including spirits. To encourage walking, there are skywalks galore, pedestrian tunnels and bridges. A monorail takes residents and tourists alike all along the downtown. Modern buses provide easy public transportation options. Sydneyites do walk a lot, but they also exercise in other ways. During lunch hours we noticed individuals and organized groups meeting to run together, do aerobics and yoga. The architecture parallels that of the major North American cities; tall skyscrapers, and showcase buildings by well-known architects. Buildings are full of light and texture, very inviting and pleasing to the eye. For those of us in the U.S., Sydney does present us with a mystery. Where are the homeless people? In three days, I could not find one homeless person on the streets or in the city’s many parks. Today we spent four hours in the Royal Botanic Gardens. Four hours? 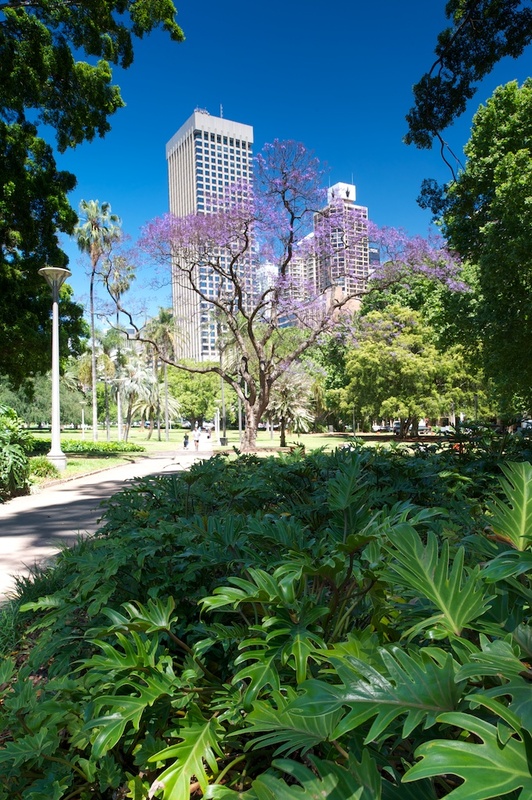 Well, for starters the gardens and the public park adjoining it are the size of the entire Sydney city center. The park and gardens wrap around a cove and offer a peaceful oasis from the hustle and bustle of the city. The park is immaculately clean, as is the entire city, by the way. The gardens are interesting not only for those fascinated with flowers and trees, but for one of their most amazing residents. But I’m not revealing what that resident is until my next blog, where I’ll share specifics on restaurants, lodging and tourist attractions that you might want to consider if⎯ no, make that when⎯ you get to Sydney.